As we’ve discussed in previous posts, the GDS Digital Inclusion team and our partners are directing a lot of our energy at building a segmented understanding of who is digitally excluded, where and why, to ensure that we target resources effectively and reach those groups who are most in need. And, on the flip side, we’re trying to build an equally segmented understanding of ‘what works’ to motivate, engage and empower harder to reach groups with digital technologies. Today’s post takes a look at a unique community centre that is working with vulnerable and hard to reach communities with complex needs. It sheds some light on how local organisations are working innovatively and iteratively to develop effective solutions that work for people in tough circumstances - by embedding digital inclusion within wider service provision. The Bromley by Bow Centre is an innovative community charity in East London. Operating in one of the most deprived areas of the UK for over 30 years, it supports over 2,000 local people each month. Their focus is on supporting vulnerable people who can be hard to reach through conventional statutory service support. 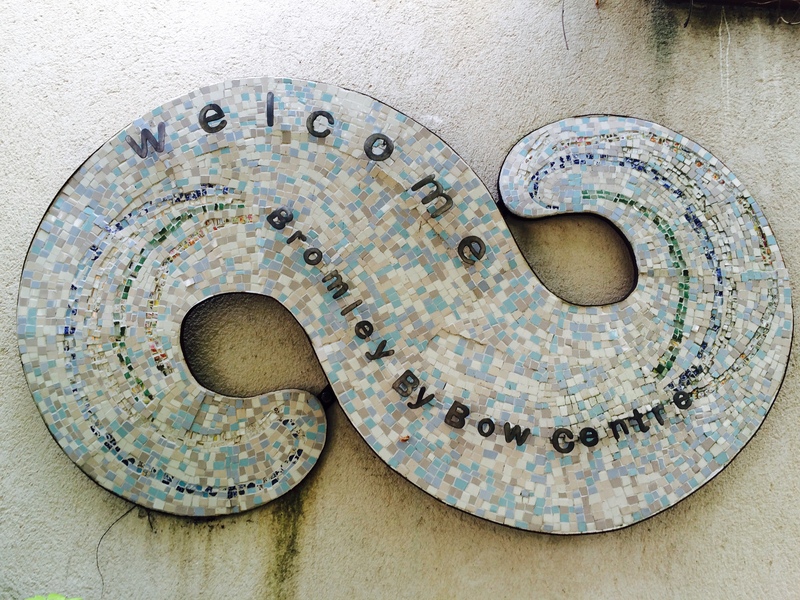 The Centre serves the local community by providing a wide range of services and activities, which are integrated and co-operative in nature. They host the local GP surgery, a variety of social enterprises, a children’s centre, artists’ studios, a healthy living centre, and provide adult education courses, care and health services for vulnerable adults, outreach programmes and a range of advice services.This approach enables GPs to refer patients to services that help to tackle the social determinants of ill health, including welfare, employment, housing and debt advice services. Accessibility is key to the approach - with emphasis on delivering a friendly, welcoming and sensitive service and making it easy for people to access support by bringing multiple services together in an integrated way. This breaks away from traditional silos, in recognition of the complex and often messy reality of people’s everyday lives and needs. Advice and support is coupled with skills and training. Their focus is on getting people “the right skills at the right time”. The broad, holistic range of services means that people can find help for both their most immediate problems and longer term deep-seated issues. The Centre helps people get through their immediate crises, but also focus on identifying the underlying problem and help people take steps to finding long-terms solutions. The emphasis is on “long journeys” - encouraging people to gradually build up the skills and confidence they need to progress in life and build a positive future for their families. The Centre’s approach to digital inclusion echoes these wider principles. Every individual is seen as having bespoke needs, which the Centre needs to cater for, and they look at a broad set of issues in parallel, supporting digital inclusion alongside literacy and financial inclusion. We take a look at some of the ‘key ingredients’ to the approach below. A key piece of learning that we took away from our visits is that, for some people, more pressing needs may need to be addressed alongside, or before digital inclusion can be introduced. For example, some people may not be physically or mentally fit and first need support from a health coordinator. Many are unable to speak even basic English (their key client group is predominantly the Bangladeshi community, in addition to Somali and European communities) and may lack the basic literacy skills required to start to develop their digital literacy. The Centre tackles this head on, innovatively through embedding digital inclusion support within a whole range of support and services under one umbrella. More often than not, digital literacy and wider literacy go hand in hand. So, for example, all ESOL (English for Speakers of Other Languages) learners get digital training, and digital is embedded into the language schemes on offer, such as English my Way. On the Learn my Way health programme, people are encouraged to go online onto NHS choices and health page and, for example, find health information on things such as illnesses and their cure, healthy eating, physical activities and calculate their BMI. Just last week, a new programme was launched where staff take groups of people to the GP surgery to complete online registration forms, and start accessing GP online services. As well as offering formal training in digital skills, there are also informal opportunities for people to start to build their confidence and motivation. In the “connection zone” (the reception area) laptops are scattered around the room. Here, visitors might see other community members making use of these - and, “seeing people who look like you” on a computer can be a powerful motivator. This is the kind of “show and tell” that you don’t get in the classroom, and can be key to encouraging people down a more formal training route. As one of thestaff members told us, “when they do get involved, they love it. Only the first step is difficult. Once they know some of the skills, they get more confidence”. 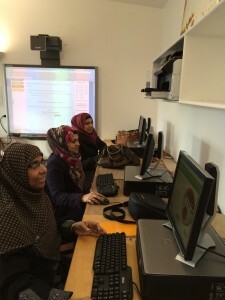 Those who’ve completed some of the digital skills modules then go on to become “digital champions” who give support and encouragement to newcomers to the programme, helping them to build their confidence, motivation and skills. The peer to peer model is held up as “inspiring and powerful”, and volunteering is promoted more generally by the Centre as a route into work, and a way of building trust and connections with the community. Our conversations with staff and clients revealed that different cohorts will have different hooks for getting online. A deep understanding of the needs of the individuals and groups who visit the Centre helps ensure an approach that is responsive to people’s personal needs and motivations. For example, among mothers, children’s internet safety is often a key priority, while for younger women, online shopping is a motivator. Older men may want to keep up with the times via the online Bangladeshi news sites, while young people in their 20s and 30s are interested in accessing music online or email. We got to meet and talk first-hand with some of the people enrolled in their programme. As we walked into the room, one woman was completing a Learn my Way module, another was finding out about government online services, and yet another was learning about internet security - how to create a password, and how to ensure her children would be safe online. A man was busy with an online dictionary site. Digital champions were on hand to offer individual help and support as needed. One woman said that, prior to getting involved in the programme, she had used a computer for word processing but “didn’t use the internet at all”. Now, she uses Facebook and email to contact and keep in touch with friends and family, share photos, and “have fun”. She also likes to shop online, on Tesco or eBay. Her “best thing” about the internet is NHS Choices, and the locator service for GPs and hospitals in the local area, which also allows her to view customer service ratings. She says that the internet “is important for everything” these days, and feels that people who are not able to go online “lose out” and find their lives are “slowed down”. Lack of English skills can make it difficult, and means that learning and doing certain tasks can take extra time. However, she finds that using the internet has helped her improve her English skills. Initially, she used to listen to the radio online, and now has progressed to reading English to improve her language skills. At first, she was a “bit panicky” but now is confident online, and finds it “nice and fun”. She admits there is still more that she feels she needs to learn, and she sometimes forgets how to do things - she has to “keep practicing”. When she gets stuck, she approaches her grown-up children for help. Previously, she relied entirely on her children and husband to do anything that needed to be done online - but now can do much of this herself. She’s still improving, but being able to do things on her own “is a good feeling”.